I am sure that most of us are aware that we are not allowed to use any portable electronic devices during an aircraft’s take off and landing. I also know how annoying it is to stop my “Cut the Rope” session just as I am about to go to the next level because the plane is taking off or touching down.That’s cruel right? It is not humane to interrupt anybody killing those green pigs who stole those adorable Angry Bird’s eggs. 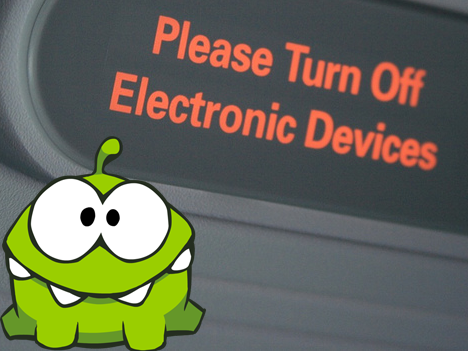 I am glad that the FCC has finally heeded our most pressing concern- to keep killing those nasty Zombies on our mobile devices during take off and landing. It was reported that the FCC recently urged the FAA to reconsider this issue. In response to growing public pressure, the FAA formed a committee in August to study its current policies on electronic devices, but so far no recommendations have been made. Hopefully, this nudge from the FCC can provide a little extra motivation to move things along. In a way that doesn’t end in planes dropping out of the sky, of course. Be wary, my little spider foe, we will soon be able to continue “Cutting that Rope” during take off and landing without ending on the FAA’s no-fly list.